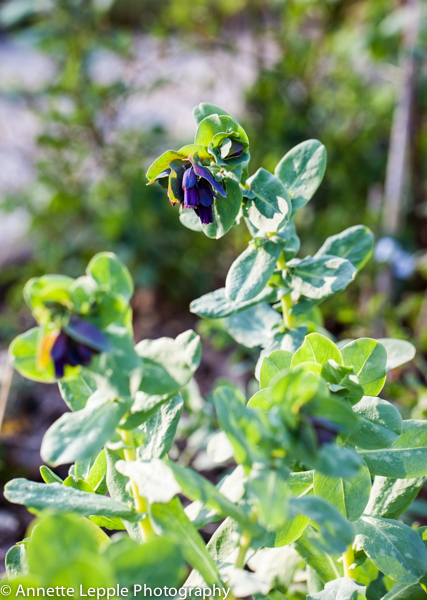 Cerinthe major Purpurascens kam gut durch den Winter und wird hier im Süden zu dem, was sie eigentlich ist: eine Frühlingsblume. Sowohl in meinem Alpengarten wie in Irland war sie eine Sommerblume. Cerinthe major Purpurascens came well through the winter and is turning into the spring flower it is meant to be. In both my mountain garden and in Ireland it very much used to be a summer flower. Einer meiner Lieblingsplätze unter der Weide…am Hang dahinter wird sich bald meine englische Narzissenwiese entfalten. Watch this space! One of my favourite places underneath the willow…on the slope behind my English daffodil meadow will work its magic soon. Watch this space! Die Farben der Ranunkel werden jedes Jahr bezaubernder…hier mit Nasella tenuissima. 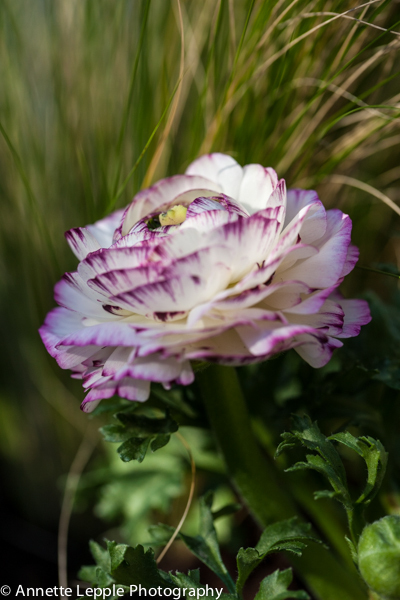 The colours of Ranunculus get more beautiful every year…here with Nasella tenuissima. 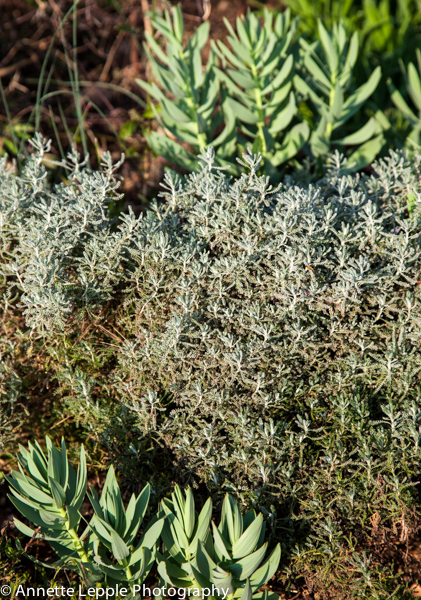 Ich liebe Euphorbia characias…spritzig, frisch, wie eine limettengrüne Woge, die mich mitreisst! 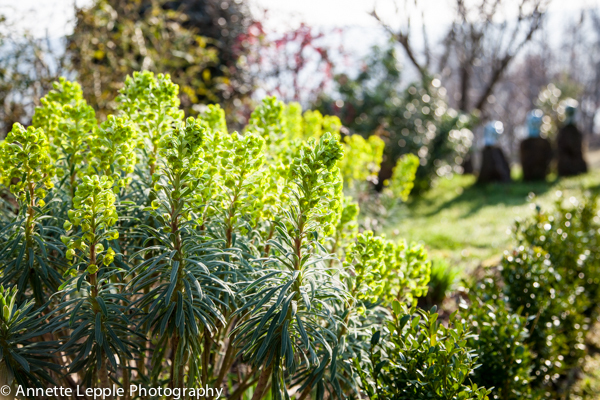 I love Euphorbia characias…refreshing, like a limegreen wave carrying me away! Letztes Jahr verliebte ich mich in Crocus Yalta und habe im Herbst nochmals eine Ladung vergraben. Sind sie nicht schön? Last year I fell in love with Crocus Yalta and planted another lot in autumn. Aren’t they beautiful? Heute ist zwar erst Donnerstag, aber ich wünsche euch allen dennoch ein wunderbares Wochenende! Today is only Thursday but I wish you all a wonderful weekend! Vielen Dank, liebe Annette, dass Du uns in Deinen bezaubernden Frühlingsgarten mitgenommen hast! Wir wünschen Dir einen sonnigen Tag! Klar, das tun wir – ein schönes Wochenende wünschen wir Euch!! Die 10cm gehen hoffentlich ganz schnell wieder weg – habt’s gut ihr drei! Wow, das ist ja eine umwerfende Blütenpracht. Da sieht man mal, was der Breitengrad so ausmacht. Hier blühen noch nicht einmal die Forsythien. Aber bei Dir kann ich mir schon einen dicken Vorgeschmack auf das was kommt holen. Ganz wunderbare Aufnahmen!!! Nicht mal die Forsythien? Da muss es ganz schön rau sein. Danke & ebenfalls liebe Grüsse! Beautiful photos, Annette.That is going to be quite a show very shortly, I will keep an eye on the English Daffodil meadow. You have so many beauties blooming now. Won’t be long now until the daffs are all out – can’t wait! Lovely, lots happening in your garden. Crocus Yalta is new to me, I shall look out for it, it’s gorgeous. I absolutely adore Stachyurus, what a great idea under planting it with Chionodoxa, I might just copy that idea. Have a lovely weekend. 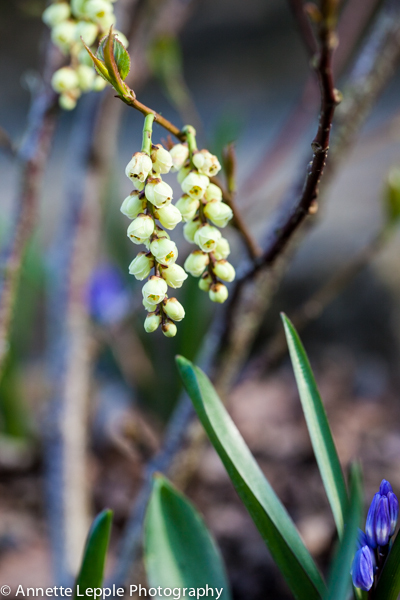 Yalta is a real star, Chloris, extremely long lasting and the blue flowers underneath Stachyurus look great indeed. What a lot of beautiful flowers you have – your garden is well ahead of mine. 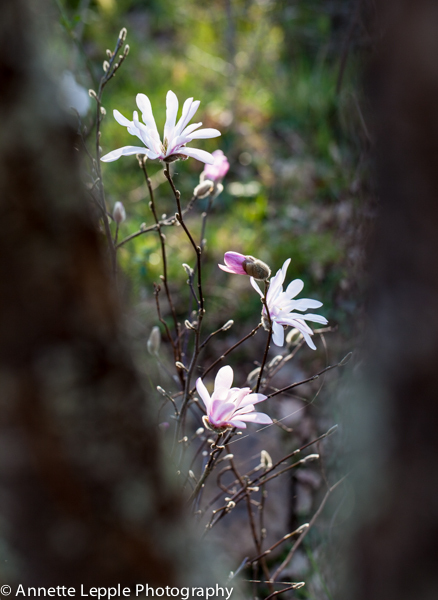 I think the magnolias have a few weeks yet before they will flower. That ranunculus is stunning – is it just growing in a border?I love the crocus yalta – I will be planting more in the autumn now that I have seen yours. 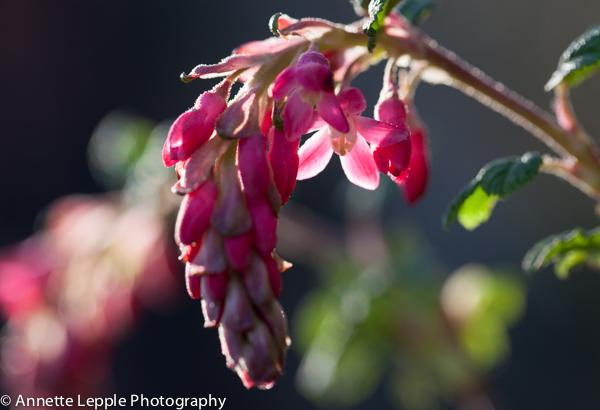 Also the ribes looks beautiful – that is a plant I have never grown but might considernow. 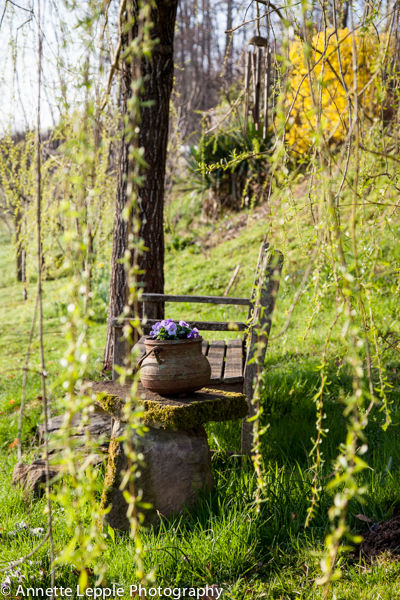 Thank you for this look around your garden – it is inspirational! Everything is two weeks ahead, I’d say, Julie. Ribes is a great plant if you have enough space as it’s not that exciting for the rest of the year. Such lovely blooms. 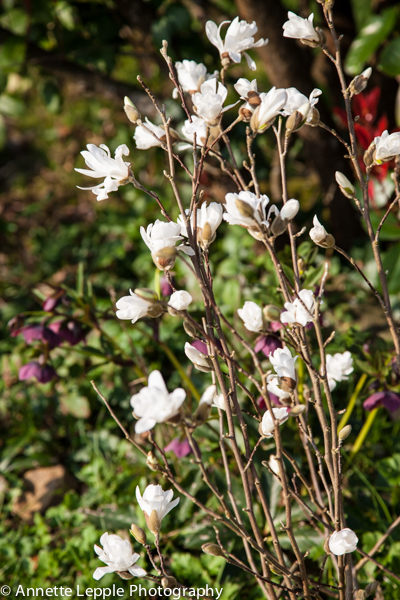 Magnolia stellata and Scilla are two of my favorites. Hach, ist das zum Schwelgen schön! Up to now I felt we were rather behind you but for the past 10 days we’ve had 15-20°C and there’s no end in sight. That made a huge difference and I’m enjoying it. 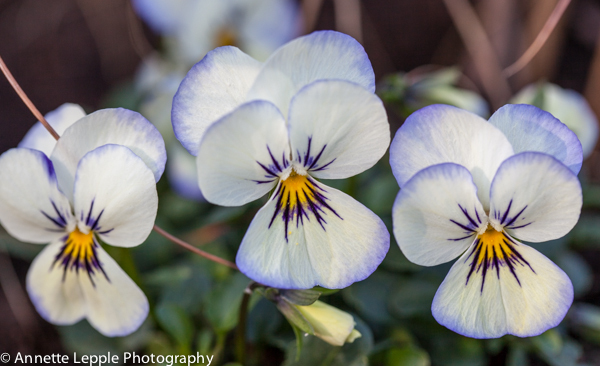 All the lovely flowers have come out to play in the sun! Enjoy your sunny weekend! Thank you, Christina, you too! Lovely! 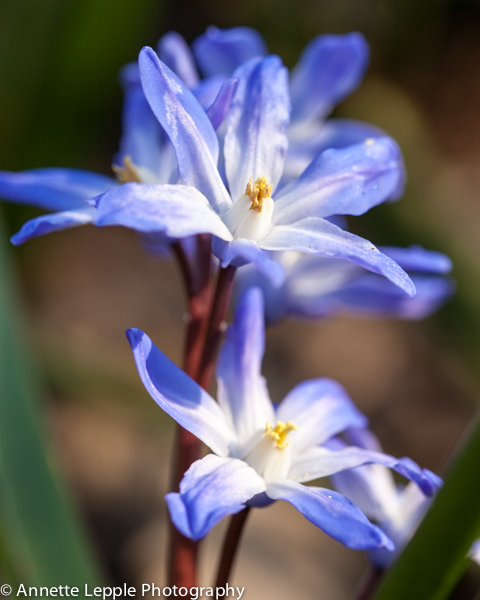 So much is flowering in your garden already! We have had some wonderful sunshine too, but the garden is waking up slowly here. Look forward to seeing your meadow soon! 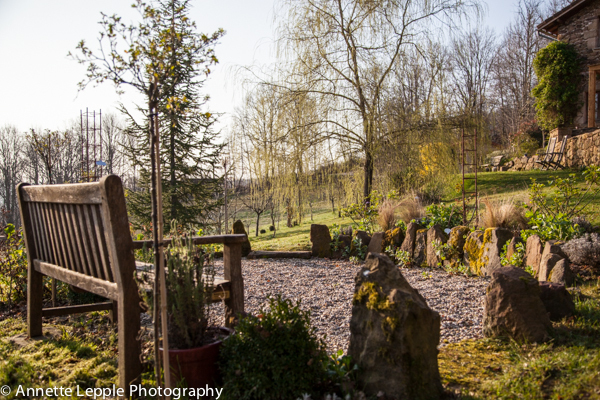 Lovely garden…I can’t believe how mild your winter was this year. We were in Bavaria for their first snow storm in October but it seems their season was mild as well. Thank you, Julie, very kind! Du hast so viele Blumen, dein Garten sied Umwerfend aus. 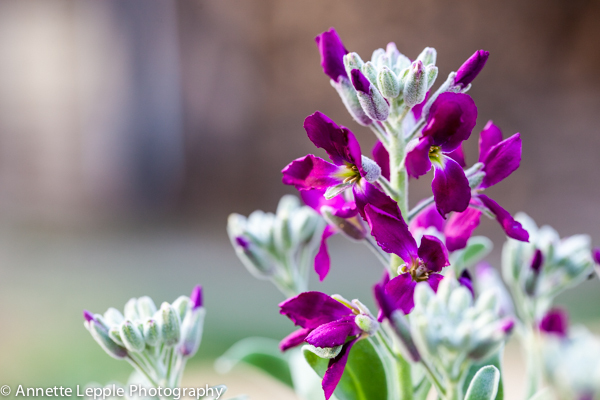 It’s a treat to get a glimpse of your lovely garden Annette and imagine the fragrances and sounds. The seating area with the mossy rocks is inviting and peaceful. It is, Susie, especially in summer when the dappled shade is so comfortable. Hope your garden is waking up as well. You have a beautiful, restful, garden Annette, with such lovely plants. Love your various seating areas. You can never have enough seats in a garden! Your plants seem so much further ahead than ours here. My Magnolia stellata is still in bud. They are a thing of beauty in themselves – so soft and furry! 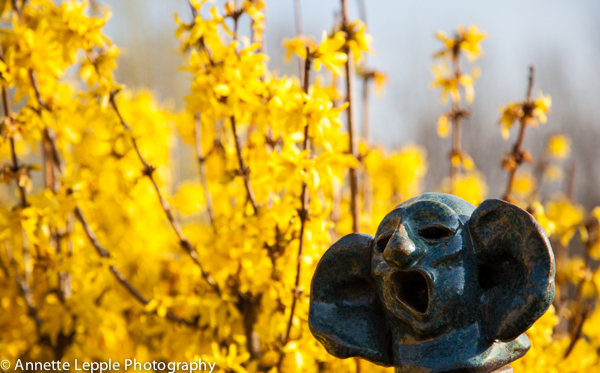 Do you agree that Forsythia, albeit ubiquitous, is such a cheery sign of spring? Especially against a bright, blue sky! I absolutely agree, both for seating areas and Forsythia! Due to the high temperatures we’re 2 weeks ahead and the best thing is: it’ll continue like this. 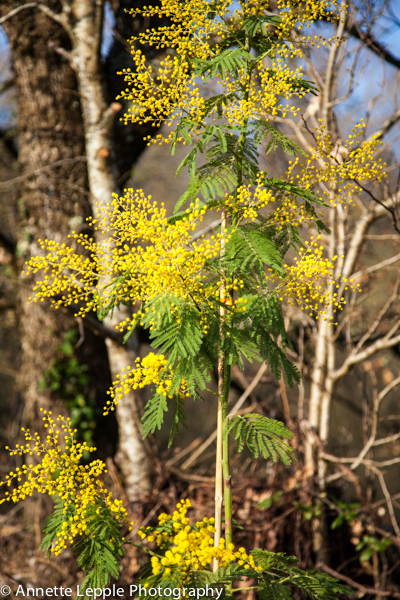 A lot of plants are despised fro being ubiquitous but I tend to like many anyway, e.g. berberis, cotoneaster. It was a real treat having a little wander around your gorgeous garden Annette – how lovely that you are able to use the garden shower so early in the year. You’ve a wonderful array of colours and obviously the Magnolia is magnificent and I love the colour of the Ranunculus. Enjoy your weekend – I hope the good weather continues – its forecast not to be so good here! dein Garten ist wirklich ein Paradies! Wie schön muss es sein, da täglich durch laufen zu dürfen! Auf die Narzissenwiese bin ich schon gespannt! Ich habe auch einige walisische Daffodils im Garten. Da freue ich mich schon auf Fotos deiner daffodils, liebe Renate. Hoffe, auch dein Garten ist in Frühlingsstimmung, viele Grüsse! I should not look at your pictures Annette. It is too cruel because then I look out of the window and I see piles of snow! If I were granted a wish to grow one plant that does not survive here, it would be Euphorbia characias.Yours look lovely. I couldn’t grow E. characias in my mountain garden adn I’m very happy to have all sorts of Euphorbia now. They’re such good performers. Is it normal for you to have that much snow? How long have you been creating this garden? You seem to be so far along yet I thought you’d been there only few years… plus there is a house that needed work, correct? I love your tours and love the variety of goodies you’ve added to the garden, every day it becomes more of an Eden. Happy spring and happy weekend! 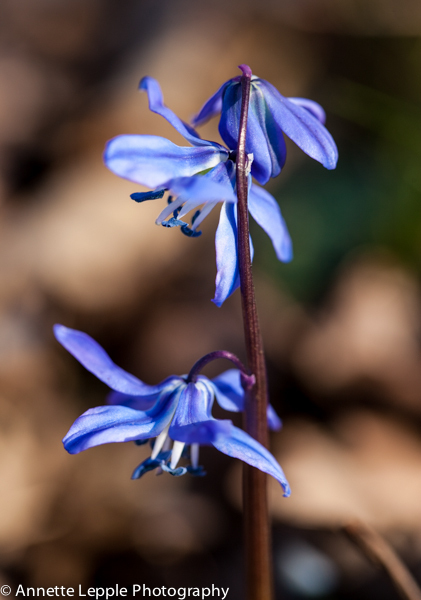 How did I miss your lovely post about your beautiful spring flowers.Sorry this is late. What a lot you have to enjoy at the moment, your garden must be a pretty place to be! Don’t be sorry, it’s such a busy, lovely time, Pauline and I hope you enjoy it too! Hope that you had a good weekend Annette. Glad to read that Rudoph is keeping a low profile and is not nibbling any of your beautiful spring flowers. So kannst du dich zweimal an den Blüten freuen, liebe Marlies. Die Euphorbien versamen sich auch prima, ohne ein Problem zu werden. E. rigida, x martinii und mellifera gehören noch zu meinen Lieblingen. Hab eine gute Woche! You’ve got so much in flower there. We’ve had the same beautiful weather with everything growing at a pace. Do you grow your ranunculus outside? I’m growing some for the first time this year.